Skiers make use of the groomed trails on MacDonald Pass. Only 15 miles west of Helena, MacDonald Pass offers some of the finest groomed Nordic skiing in the region. A ski on Mac Pass provides a fun experience through semi-alpine forest. Maintained by the Last Chance Nordic Ski Club, groomers smooth paths for classic and skate skiers and for a variety of skill levels. Park at the turnoff just north of the summit in the well-defined parking lot. Take off north for about three-quarters of a mile to the first trail junction and bathroom facilities. From there, skiers have the choice of four loops of varying length and difficulty. 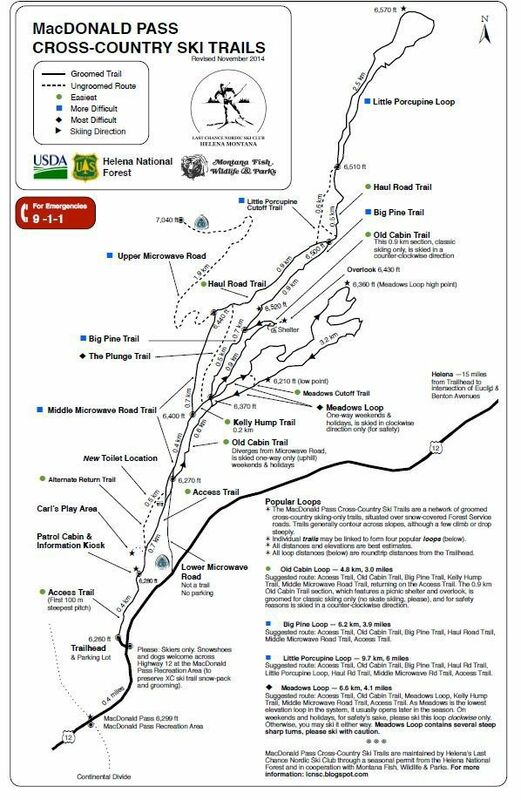 The Old Cabin Loop is the shortest and recommended for first-time visitors to the trail system. At 3 miles, the loop is designated as classic-only and skiers are directed to ski counterclockwise. At 3.9 miles, Big Pine Loop is rated as moderate and offers multiple routes, including connection to spur trails and Little Porcupine Loop. Little Porcupine is the longest ski in the area at six miles but is also rated at moderate. For advanced skiers, the 4.1-mile Meadows Loop is the most challenging in terms of terrain, tight turns and elevation. Mac Pass comes with its share of advantages over some other popular Nordic skiing spots in the area. Grooming means consistent snow and the elevation typically provides some of the earliest and latest trails in the region. Because of the trail grooming, the club asks that snowshoes, dogs and bicycles stay off the trails and suggests visiting ungroomed trails on the top of the pass. The ski club also offers an exceptional amount of information on trail conditions, with frequent grooming and snowfall updates, special events such as ski clinics, and even an app to track skiers along the trail. Updates can be found at http://lcnsc.org/macdonald-pass/. While the trails are free to use, the club does offer membership and accept donations to keep its grooming program plowing along. The quality of the trail system also speaks to its popularity, and warmer winter days can bring skiers out in droves. In the winter of 2017-18 the club recorded nearly 4,500 skiers using the trail system in what was an exceptional snow year. With this winter starting slow but coming on strong in February, skiing won’t be stopping any time soon on Mac Pass.